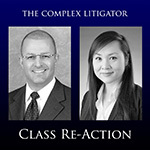 Episode 18 of the Class Re-Action Podcast is now live! Episode 18 is here, discussing how Epic (and its utter termination with extreme prejudice of the NLRA theory that class waivers impair concerted employee activity) will drive PAGA litigation. And then we turn to Huff, which makes that prospect of more PAGA litigation significantly more daunting for employers. American Pipe, we had some good time. Sniff. But now you're dead to me. Pack your stuff and get out. The Unites States Supreme Court, in China Agritech, Inc. v. Resh, et al. (June 11, 2018), answered a question that, as far as I have observed, wasn't being asked with any stridency for years. That question was whether American Pipe equitable tolling applied to a subsequent class action (as opposed to individual action) when the plaintiff bringing the second action (a putative class member from the first) would have a time-barred claim absent the equitable tolling. The Morales complaint sought recovery of unpaid wages on behalf of class members employed by Williams-Sonoma since June 24, 2009. The allegations in that case included the claims of failure to provide meal and rest periods, overtime and minimum wages, timely wages, and final paychecks to the Morales class plaintiffs. Slip op., at 12 (boldface emphasis added). Separate from all of this, I have a concern about the Villacres holding that allows any enumerated list of released items to be treated as a "general release." This seems to muddy the waters as to what constitutes a general release and what constitutes a specific release. As it stands, this seems to re-define "specific release" to mean a release with an expressly enumerated scope and a "general release" to mean any release with coverage broader than what is expressly enumerated, particularly where identified by the phrase "all claims." So you can have a "general" release of "all" wage payment claims. Perhaps we should call "general" releases "total coverage" releases and all other releases "specific" or "itemized" coverage releases. (1) Wage Order 9 exempts from its wage statement requirements an employee who has entered into a collective bargaining agreement (CBA) in accordance with the Railway Labor Act (RLA). See 8 C.C.R. § 11090(1)(E). Does the RLA exemption in Wage Order 9 bar a wage statement claim brought under California Labor Code § 226 by an employee who is covered by a CBA? (2) Does California Labor Code § 226 apply to wage statements provided by an out-of-state employer to an employee who resides in California, receives pay in California, and pays California income tax on her wages, but who does not work principally in California or any other state? (1) Do California Labor Code §§ 204 and 226 apply to wage payments and wage statements provided by an out-of-state employer to an employee who, in the relevant pay period, works in California only episodically and for less than a day at a time? (2) Does California minimum wage law apply to all work performed in California for an out-of-state employer by an employee who works in California only episodically and for less than a day at a time? See Cal. Labor Code §§ 1182.12, 1194; 8 C.C.R. § 11090(4). (3) Does the Armenta/Gonzalez bar on averaging wages apply to a pay formula that generally awards credit for all hours on duty, but which, in certain situations resulting in higher pay, does not award credit for all hours on duty? See Gonzalez v. Downtown LA Motors, LP, 155 Cal. Rptr. 3d 18, 20 (Ct. App. 2013); Armenta v. Osmose, Inc., 37 Cal. Rptr. 3d 460, 468 (Ct. App. 2005)? Of the two sets of questions, Delta certainly presents questions that are likely of broader applicability. California Court of Appeal examines American Pipe tolling in Fierro v. Landry's Restaurant Inc. In the federal system, because there can be no appellate review of an order denying class certification until after entry of a final judgment in the class action, there can be years of delay—including potentially a trial on the merits of the individual claims—before the parties have the benefit of appellate review of the denial of class certification. Under such a procedure, the policy of protecting the efficiency and economy of litigation is not furthered by the continuation of tolling—first, pending resolution of the remaining claims in the trial court and, then, pending review and disposition in the appellate court. Slip op., at 20. The Court's effort to get under the hood and examine how policy interacts with procedural differences is commendable. Separately, this case presents an unusual procedural history in its own right, as the Court had to engage in some very proactive digging to try to get as complete a record as it could and still fell short of getting all of what it wanted. Appellants were successfully represented by Matthew Righetti and John J. Glugoski of Righetti Glugoski.